The Vancouver Chamber Choir opened their 2004 - 2005 season with a program that recognized the sixtieth anniversary of the establishment of diplomatic relations between Mexico and Canada. The Consulate General of Mexico, Señor Héctor Romero was in attendance to offer his remarks on the occasion. This special selection of works from the two countries got under way with choirmaster Maestro Jon Washburn leading the entire twenty-member choir in Hernando Franco’s Magnificat sexti toni, a historical choral work from Mexico’s early colonial period (circa 1580). This is a beautiful psalm, rendered by the choir with typical clarity and coloring. Angel Padilla-Crespo was welcomed onto the stage with enthusiastic applause. Señor Crespo is a harpist of formidable dexterity and musicianship, he performed Isaac Albéniz’s two movements from Suite Española with impeccable individual artistry and empathy. Albéniz probably never wrote anything for the harp, but his Granada and Asturias transcribe very well. Crespo exhibits good command of the Spanish musical idiom. His playing is technically superb, but more importantly he has the flexibility and understanding of the music's rhythms to make it come alive. 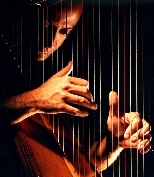 Señor Crespo remained on stage to provide harp accompaniment to soprano Joanna Dundas in her solo performance of "Dibujos Sobre un Puerto" (Sketches of a Port) composed by Arturo Márquez. Sung in Spanish, Ms Dundas’ interpretation of the lyric and dramatic demands of the song’s complex themes was an invitation to delight. The Johannes Brahms Vier Gesänge (Four Songs), featuring only the female members of the choir, accompanied by Brian G’froerer and Stephen Denroche on French horns were particularly moving. While the singing was exceptionally beautiful, there was a profound effect from the contrast between the singers, very much in the prime of life and the songs, their words, and music, preoccupied with death. The text in the second song, from a Shakespeare sonnet, drew from Brahms his most moving music. The most original composition on the programme was the curiously titled "Miniwanka" (Moments of Water) dedicated to the power and importance of water in nature. Through trickling vocalization, the choir depicted the natural cycle of water. While male choir members carried the melody, female members emulated the sound of raindrops. The choir rounded out the programme with a selection of traditional folk songs collectively titled Ensalada!, arranged by Maestro Washburn. This was a wonderful curtain-raiser for the Choir. What better way to begin a new season than to honour the friendship with our other North American neighbour.